We’d love your help. 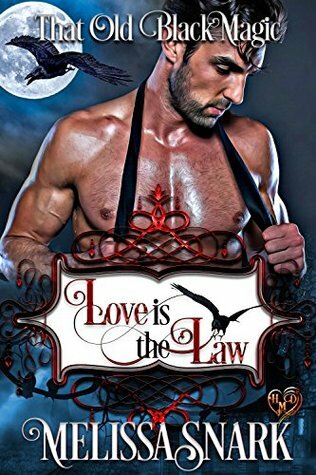 Let us know what’s wrong with this preview of Love is the Law by Melissa Snark. Hotshot LA lawyer Chase Baron doesn't know whether to kiss or throttle his best friend's little sister. She's a spoiled, unpredictable brat, and she drives this alpha wolf shifter howling mad. The last thing he wants is a chaotic witch disrupting his orderly life. When magic frees him of all his inhibitions, his wolf claims his one true mate. Once the claiming is over, how Hotshot LA lawyer Chase Baron doesn't know whether to kiss or throttle his best friend's little sister. She's a spoiled, unpredictable brat, and she drives this alpha wolf shifter howling mad. The last thing he wants is a chaotic witch disrupting his orderly life. When magic frees him of all his inhibitions, his wolf claims his one true mate. Once the claiming is over, however, he's left mired in resentment over his lover's manipulation. Arabia Jensen doesn't mean to cause trouble. It's her natural-born talent as a raven shifter. She casts a Heart's Desire spell intended to capture the attention of a certain stubborn werewolf. But after the magic takes hold, she's the one who loses control. Arabia finds more than just her hands full with a big bad wolf who's horny and lookin' for love. Once the pandemonium fades, Arabia's antics land her in prison. Chase is the only attorney willing to take her case, but even he thinks she's guilty. What's a woman to do when the man she loves believes she's committed crimes of the heart? It's more than just hex appeal. It's a recipe for true love when sassy heroines and alpha heroes undergo a trial by love-in to discover their one true mate. To ask other readers questions about Love is the Law, please sign up. What a great story with a very important message, communication is necessary to having a good relationship. The Ravenborn Clan and the Baron Pack were allies and hunted together for many, many years. Princes Arabia of the Ravenborn Clan was always in love with Chase Baron of the wolf pack, but all she ever did was follow him around, but never let her feelings be known. Now that she is an adult and living far away from him she realizes that she must get her claws into him, he is her chosen mate and she resorts to trickery as is the norm for ravenborn, only her methods prove to be a little trickier, her trickster comes out to play... Will she succeed in getting her man, or will all her wiles backfire on her? Successful alpha and lawyer Chase Baron has always felt a need to protect his best friends little sister the cute and tricky raven Arabia and now she is going to need his help more than ever, but will he be able to get her out of this one without losing himself to a truth he has never wanted to admit to himself? This was a fantastic story. We get action, mystery, and suspense. The hotness is off the charts too. Chase has known Arabia since she was a little girl her brother is his best friend. These two are an odd couple and Arabia has wanted Chase her entire life but he is a bit dense when it comes to those things so she decides to take things into her own hands errr magical hands I should say. Arabia finds herself in a bit of a pickle and it's up to Chase to save her yet again but can he? The town where Arabia has been wants her head on a pike you could say so who knows if this Alpha wolf has what it takes and then who will save him? Chase Baron is getting very frustrated. Arabia Jensen is standing by her convictions. They were certainly an interesting pair. Can people with two different backgrounds become a couple? Their personalities seem so polar opposite. I was impressed how Arabia didn’t back down when others may have. She believes in what she did. Her story is something that could be based on fact – there are certain things that are said throughout the story that backs that up. Chase seems a little stuffy and needs some Chase Baron is getting very frustrated. Arabia Jensen is standing by her convictions. They were certainly an interesting pair. Can people with two different backgrounds become a couple? Their personalities seem so polar opposite. I was impressed how Arabia didn’t back down when others may have. She believes in what she did. Her story is something that could be based on fact – there are certain things that are said throughout the story that backs that up. Chase seems a little stuffy and needs something to shake up his world. This was very easy to read which is kudos for the author. She made it very easy for me to picture every scene as if I was there in the background. I also got my emotions involved because of what Arabia had to endure. Plus knowing she had someone fighting for her – even though I questioned that a time or two. We have a paranormal twist for the age-old question, can opposites attract? Maybe they just needs a little help? Arabia may have pulled at my heart but Chase had my head because I never could figure out what he was going to do next. That means I had to keep turning the page in order to figure it out. And having a chuckle or two didn’t hurt. What a volatile relationship this is! The differences between wolves and ravens are legion. Even knowing each other for years, they make mistakes that have devastating effects. Arabia is such a rascal - and impatient! Chase appears straight laced, cautious, and he compromises the heck out of everything. Definitely not Arabia’s style! These two are dynamic couple, their love shown in mostly unspoken ways. The danger set in motion by Arabia’s actions is mind-boggling. I love the w Delightful reading! I love the word-play; the humor liberally laced throughout the story. Not to be missed! I received a copy of this book through BookFunnel and I chose to review it. This book is well written and the characters are great. I wasn't sure I was going to like this one but I gave it a chance and was pleasantly surprised. Arabia doesn't let Chase run over her, she stands up to him every time she can. I don't do spoilers so you will need to get this one to see the fireworks! This isn't a quick easy read but it is worth your time and effort. I encourage you to give this one a chance! I enjoyed this fun mishap adventure. It's fresh and full of steam. You'll love the determination that our hero possesses. The witch really just wants the guy to give it and let loose. Little does she know that her spell has not only bewitched her beau, it's rampaging through her sleepy town. When trouble comes calling it's her hot guy to the rescue. If you love wild scenes with lots of heat and passion, this should be your next read! Amazing start to this multi author series! I loved this intro book to the That Old Black Magic series! The story starts after the spell was cast and Arabia has been arrested for causing chaos with her spell, which was only intended to lower the doubts and fears of the man she loves. I really hope that her brother Reidar gets his own story! Am truly looking forward to the rest of this series! I liked the twists and turns of this story and I'm going to come back and pick up the other books in connected to this one. I'm most excited about the cop in the bar story for sure. The bear... yea that one sounds funny. Subscribe to Melissa Snark's newsletter for new releases, prizes, and lots of fun. http://www.melissasnark.com/mailing-l... (Just copy & paste the link into your browser.) You'll get a free ebook just for signing up! Author Melissa Snark lives in the San Francisco bay area with her husband, three children, and a glaring of litigious felines. She reads and writes fantasy and romance, and is publ Subscribe to Melissa Snark's newsletter for new releases, prizes, and lots of fun. http://www.melissasnark.com/mailing-l... (Just copy & paste the link into your browser.) You'll get a free ebook just for signing up! •	She blogs about books and writing on http://www.thesnarkology.com/. Visit her website at http://www.melissasnark.com/.